I recently came upon a interesting analysis of the paint scheme of the original Ashland (Oregon) depot-hotel, erected in 1888. It brings up an interesting topic: the use of a red window trim on these early buildings. The quote below is an excerpt from the application to the National Park Service for inclusion of the building on the National Register of Historic Places and was prepared in 1990 for the (still-) surviving south end of SP's Ashland depot. "Exterior paint analysis (cratering technique) indicates the original paint of the depot was a deep grey colored paint, with a sand finish on the lower 5' feet, more or less, of the siding. The lower portions of the window and door trim was also sand-painted, in this case with a deep reddish/brick color. Photos indicate a slightly lighter color paint (without sand finish) was used above to the soffits although cratering does not bear this out ... All subsequent paint colors of the Ashland Depot are various shades of the yellow/mustard color body and deep umber trim that is typical of Southern Pacific buildings throughout Oregon. At least six different coats of yellow are present on the Ashland Depot structure." Thank you for the excellent information. It is exciting to see what your knowledge of paint and depot archeology can contribute to these topics. 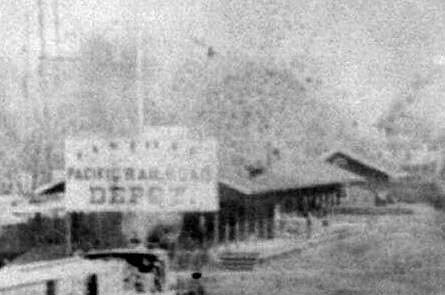 This supports clues found in a photo of an Espee CS22 depot which was shown in an early view in the table of depot photos in the appendix of one of Signor's books on the Shasta Division. In that black and white image, the sash are very clearly shown in a contrasty dark tone, which I gut-felt was a red, but had lacked a lot of physical proof for a long time. But, I found what appeared to be a single layer of deep oxide red/wine color on the sash of one other depot in the gray/drab color period ... I can't recall whch building it was (off the top of my aged head I think it might have been the Livermore depot) but the evidence was strong enough to make me believe I may find it again, somewhere, sometime, given a chance to do other surveys. The use of this oxide red sash trim seems not to be widespread on the SP system — the predominant number of depts which I've surveyed with origins dating c.1877 to 1890+ have warm lead-white sash, even in the earlier 2-tone green late 1870s-early 1880s and solid "metallic" brown with rose-beige trim eras of the mid 1870s. The sanded paint treatment in the area we call a "false wainscot" was widespread — actually, on all SP lines, it seems to be universal when the first coat of paint was applied to any depot. It was done to (thoretically) toughen the paint against wandering baggage wagons/trucks and other abrasive stuff; was thought to serve as a fire retardant (although the oils in the paint burned just fine, even with the sand mixed in) and it always ascends the exterior stairs to the level of the freight platform if there's an adjacent, elevated baggage express annex on any woodframed combination depot. The sanding was blown into wet paint with a special bellows-gun. It's a pain ... to run a paint survey through since the sand eats Xacto knife blades and sandpaper while polishing out the survey craters ... but at least we now know to expect the stuff. My memory is similar to yours: I think it was on the Livermore depot that we found the red sash. If you all can help, I'd like to lay out a general time spread when different paint schemes were in used by CP/SP. This is intended as a general outline only, since I gather there are numerous individual variations in actual practice. 1. 1860s-early 70s - Solid "metalic" brown with white trim. 2. mid 1870s - solid "metallic" brown with rose-beige trim. No.5 - c.mid-1930s - c.1960s - basically same as No.4, but drop the amber; permit use of green composition or other roofing material(s). Now, to add complexity: Circa the early to mid-1860s there's some scant photographic evidence (Sacramento waterfront depot-like structures, either owned and built by CPRR or absorbed by CP from SVRR) that are very light in tone; and may be a buff-straw body color trimmed in white. The particular structure to which I am mostly referring was a gable roofed depot/office structure of compact size at the northwest foot of J St, on a site that may have been roughly the southwest corner of the CP Passenger Station; either the smaller building was razed to make way for CPPS or picked-up and moved elsewhere for other uses (which makes more sense, economically). Also, there's a rather Moderne-ish SP color scheme from the late 1930s that the Coast Lines slapped onto certain depots along the Peninsula (and maybe further south) about the same time that the streamlined Coast Daylight made its splashy debut. This was a 2-tone seafoam green scheme and is documented on at least three surviving depots between SF & SJ, and also at Agnew. Having never found it elsewhere, I can only hazard a guesstimate that it's purpose was to provide a trendier look when the Daylight hit the road. The seafoam green colors managed to span a c.1937 - 1960s window. I can't recall knowing what roof color went with this scheme. 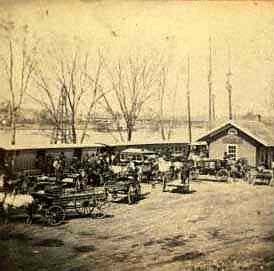 > "gable roofed depot/office structure of compact size at the northwest foot of J St ... "
That would be the 1864-67 depot (or there abouts). See attached Lawrence & Houseworth views ca 1867. 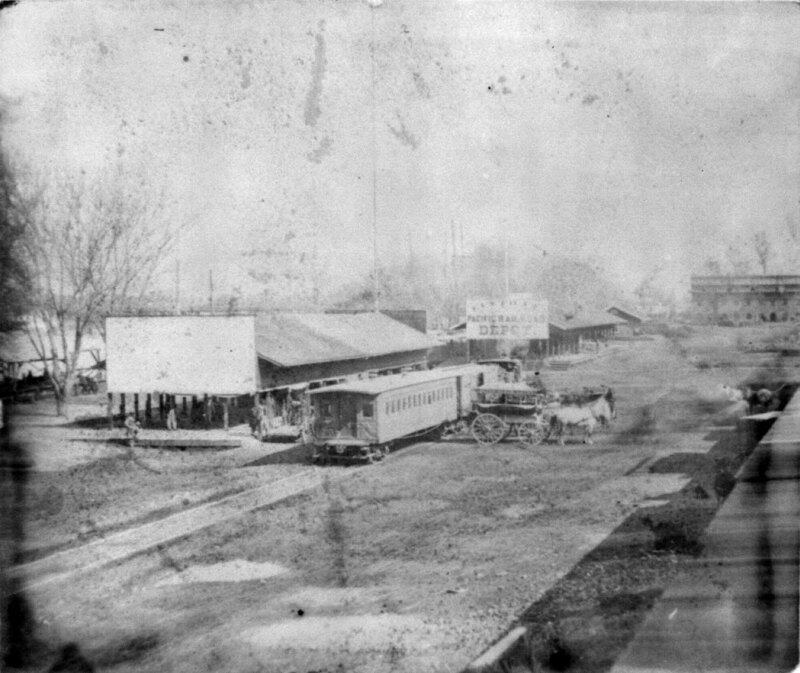 In addition to being moved or torn down, it is also possible that the building was built into the new depot as the depot space or some such use. I think it is about the width of the enclosed parts of the 1867 depot. Thanks to Kevin's comments, here is how the list stands presently. This is intended as a general outline only of when different paint schemes were in used by CP/SP. There are numerous individual variations in actual practice. 1. c. 1864 to 1867 – Light color (buff? canary?) with white trim on Sacramento depot. 2. 1860s-early 70s – Solid "metalic" brown with white trim. 3. mid 1870s – solid "metallic" brown with rose-beige trim. 4. late 1870s-early 1880s –2-tone green. 5. c. 1880s to late 1890s – gray/drab color. 7. mid 1930s to c. 1960s – as above, dropping the amber, with alternate roofing allowed: green composition or other roofing material(s). 8. c. 1937 to 1960s – 2-tone seafoam green scheme, used on some SF Peninsula depots and perhaps some other Coast Division depots. Perhaps associated with introduction of the Daylight. Well, looking at the light-colored body of the building, and thinking of the properties of blue-sensitive glass plates, how about a blue-gray for the body color? Remember, this was a period when the Gothic Revival was in fashion, and the colors used by that style in that period often mimicked stone colors.... Have a look at Moss & Moss. Many thanks. Added to the lists of speculatively possible colors for that structure.